Can You Get Stronger During Hockey Season? There's a disgusting myth being parroted all around the hockey world. ​I'm sick and tired of hearing it. So I'm here to set the record straight. What is this myth I'm talking about? ​That you can't get stronger during hockey season. And therefore, you should just focus on maintaining whatever gains you made in the off-season. ​This is all laughable to me because my athletes have proven this "rule" wrong many times over. Every year, they were hitting personal bests on our heavy main lifts like ​trap bar deadlifts and power cleans late into the regular season, sometimes just a couple of weeks before the playoffs. Why is year-round strength training so important? ​Because losing strength is directly tied with a loss in muscle mass. And when you lose muscle, assuming your weight stays the same, your body fat percentage goes up. So now you're not only fatter and weaker​, you're also less explosive because you no longer ​possess ​as much strength and muscle to generate power as you did at the start of the season. The irony is that the do or die games are played in the spring. Yet most hockey players are in the worst physical shape of their season at that point. You don't want to be one of them. Lifting heavy is not an option, it's ​mandatory. There's only one instance I can think of where maintenance training is okay - and that's at the professional level. Too many games, too much travel and only winning matters. Jobs are on the line, so no head coach in their right mind will let the strength coach run frequent hard workouts ​because it will negatively affect the team's performance in the next game. A few bad losing performances in a row, and the head coach (along with his strength coach) ​will soon find himself ​without a job. But at the junior, college and men's amateur level - yes, I'm talking to all you beer leaguers out there - ​things are different. ​There's less pressure to win games and ​​team schedules allow for more systematic off-ice training. ​My hockey players lift 4 times per week on an upper/lower split in the summer. ​But because on-ice activity takes priority during hockey season, we gotta dial back on how often we train in the weight room. Two strength training sessions per week hits the sweet spot. It's enough to stimulate strength gains but not too much that your on-ice performance will suffer. ​Just be sure to stick to low frequency, full-body workouts. ​That's right... No upper/lower split and definitely no body part splits. Otherwise, you're hitting each muscle group only once per week which is ​FAR from optimal. ​With multiple hockey practices and games each week, you've got to bring training volume down significantly from what you did in the off-season. Fail to do that, and you won't be able to recover fully between all on- and off-ice activities. There's no need to throw in extra volume just for volume's sake. If anything, it will only make you more sore. As little as 2-3 hard, quality sets per exercise is enough to make progress on a smart off-ice program. In general, you'll want to keep the number of sets per workout below 20 during in-season strength sessions. As always, when talking about intensity, I'm not referring to the perceived difficulty of an exercise but the weight on the bar relative to your 1RM. When the goal is to build strength, heavy weight is where it's at. This doesn't mean you should be lifting singles, doubles and triples every week throughout the season. It means most of your work should be done in the 3-8 rep range (depending on the exercise) while dipping lower or going higher in reps every now and then. If you do the math, she does up to 24 sets per workout. This is above the 20 sets per ​session guideline I mentioned before. ​1. She​ can power clean 135 pounds and squat 200 pounds but from a training age standpoint, she's​ still a beginner lifter. Beginners ​can recover faster from higher volumes than stronger, more advanced athletes. 2. She wants to play college hockey next season. Everything we do in training is designed to prepare her for that. Where she's at right now, the higher training volume ​might cause some fatigue at times but will lead to better progress in the long-term. ​3. Women can handle more volume than men at the same relative intensity. 4. You can do more volume early ​in the fall when players are not worn out from a long and heavy hockey season yet. The above is Phase 2 of her in-season program. ​If you want to see how exactly ​my athletes crush personal records all ​season long, then check out my Next Level Hockey Training program. If you enjoyed this article, please do a brother a favor by liking, commenting and sharing it with others who might dig it as well. 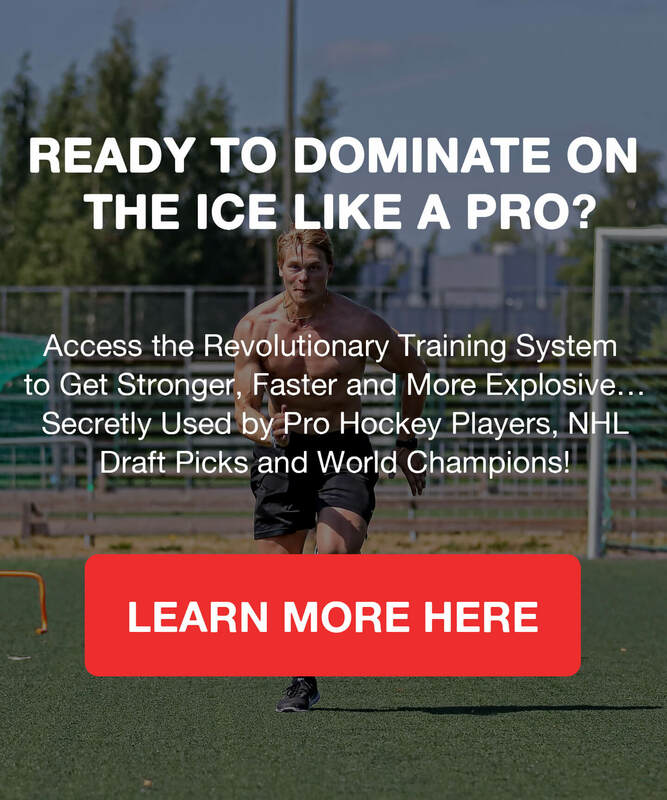 Get the Next Level Hockey Training System Now! 60 weeks of proven off-ice hockey training programs designed to get you brutally strong and powerful! Yunus Barisik, CSCS, specializes in making hockey players strong, fast and explosive. He has trained 500+ hockey players at the junior, college and pro levels, including NHL Draft picks and World Champions. An accomplished author, Yunus has had articles published on top fitness and performance sites, including T Nation, STACK and Muscle & Strength. He also wrote Next Level Hockey Training, a comprehensive resource for ice hockey players on building athletic strength, size and power, while staying injury-free. My body has matured physically a lot during the time I've been training with Yunus. I remember being a bit skeptical about Yunus at first since he never had a career as a hockey player. But I quickly realized he knows what he's talking about when it comes to making players stronger, faster and healthier. His dedication to developing his athletes, ability to explain any drill or exercise in a training program, and tremendous coaching skills all set him apart from others and make him one of the best hockey strength coaches in the business. To any athlete who wants to become stronger and faster than their competition - and remain injury-free while doing so - I highly recommend Yunus' training methods. All the strength and muscle I gained off the ice helped with stability when battling for loose pucks in the corners. In all my years of playing hockey, Yunus is the best trainer I ever had. I contacted the great Finnish club Espoo Blues and their strength coach Yunus Barisik and I got the opportunity to join them for training over 4 days. A wonderful experience that made a big impression on me. During one of their training sessions they deadlifted 3-5 reps with several players between 180-240 kg and this they did with very good technique. Damn strong guys all of them with tremendous lifting form. At the end of the off-season I set multiple lifetime personal records, including new bests in 3RM front squats and power cleans. Based on pre-season games and practices so far, I'm also feeling faster on the ice​. So you could say I'm very happy with my results since gaining strength and speed is exactly what I wanted to achieve with my off-season training. As a smaller player (5’7) playing against bigger and heavier guys in the juniors and now at the college level, I have no trouble holding my own in board battles. In just one year of training with Yunus, my strength and speed have improved dramatically! I won gold at the World Junior Championships, earned Most Valuable Player honors in the Finnish U20 Elite League, and was drafted into the NHL by the 2016 Stanley Cup champions. Next-Level-Athletics.com is a participant in the Amazon Services LLC Associates Program, an affiliate advertising program designed to provide a means for sites to earn advertising fees by advertising and linking to Amazon.com. Copyright 2018 by Next Level Athletics Oy.